As you round a corner at country Meadows of York, you hear happy banter and laughter. An animated bowling lane fills the large television screen as the opponents, Jim Diehl, 86, and Joe Gerzewski, 21, stand before it. With their Nintendo WiiTM video game controllers in hand, they cheer each other on, giving high fives, shoulder slaps and hugs. “Good job,” Gerzewski calls out as Diehl knocks down the remaining pins for a spare. They encourage each other, but make no mistake, they are competitive, too. Both men look forward to their Wednesday night games—a routine that began last fall when Gerzewski visited Country Meadows to see how he could help as a volunteer. 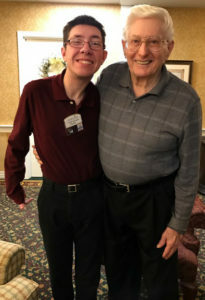 Gerzewski is an adult with special needs and recently graduated from the Lincoln Intermediate Unit’s life skills program where he worked at a retirement community helping with laundry and food services. His father, David Gerzewski, recognized that his son enjoyed interacting with the residents. The positive feedback from the community encouraged Gerzewski to find similar activities for his son closer to home. He arranged a meeting with Bonnie Geisinger, director of Community Life, at Country Meadows. 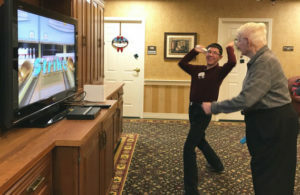 When Geisinger learned that Joe Gerzewski enjoyed playing Wii games, she immediately thought of Diehl, a resident who loves Wii bowling but can no longer play independently due to medical issues. Diehl played in bowling leagues with his church in the 1960s. When he and his wife, Dolores, moved to Country Meadows four years ago, he joined the Wii bowling league, but became unable to travel with the team. He is a good bowler with at least one 300 point game to his credit, and he isn’t satisfied playing with less skilled opponents. Playing alone is no longer an option because he has difficulty setting up the game; that’s a task Gerzewski is happy to help him do. Wii is just one of the activities Gerzewski helps with. On Wednesdays he typically arrives while the residents are eating dinner and walks a pair of dogs named Sampson and Delilah, and a dog named Muffin before setting up the Wii game. He enjoys helping and recently began leading the rosary for residents in the Connections and personal care neighborhoods on Sundays. This is a service that is dear to his heart because he enjoys serving God and wants to be a priest one day. The Wednesday night games also give Dolores Diehl an opportunity to visit with friends, take a walk, or get caught up on laundry. Diehl says her husband has always been very competitive, so it’s great that he has someone that can play at his level. What a great idea for seniors? It is, and our residents (and co-workers) love it! Thanks for sharing your thoughts.